ADB logo at HQ entrance gate, Manila. Recently, someone from one of our developing member countries commented that ADB is too small, slow and self-centered. This assessment might sound harsh, but the numbers speak for themselves, especially with respect to ADB’s volume of assistance. In fact, it applies not only to ADB but to the entire development community. ADB assistance accounted for about 1.7% of Asia’s total public sector development budgets in 2000. In the last decade, government budgets have increased by more than five times while ADB’s support has not even doubled in real terms. As such, our assistance has declined to about 0.5% of the region’s development financing. At the same time, other sources of financing have become more prominent. Net private flows into developing Asia have increase more than 6 times, remittances have grown more than 5 times, and foreign direct investment has more than doubled during the same period. Our assistance has not kept pace with these financing sources, as you can see. 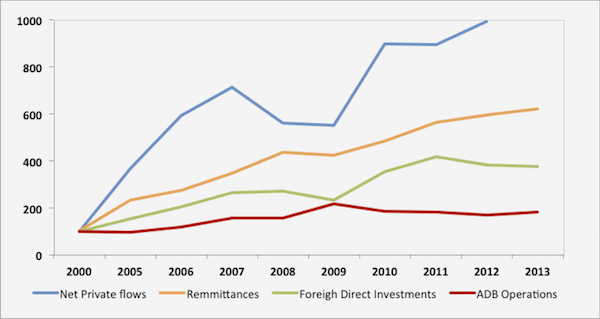 Net private flows, remittances, FDI, and ADB operations 2000-2013. Sources: ADB Key Indicators 2014, World Development Indicators (World Bank). While the comment may hurt our pride, we need to take this feedback seriously. I believe it was provided not with the intention to belittle our role, but to encourage us to improve our relevance. The relative decrease in ADB’s level of resources as compared to other sources is a reality. However, this should not necessarily diminish our role. Rather, we need to redefine our role and approach. We can, in fact, further enhance our relevance by doing better on the “3 Cs,” or making our assistance more catalytic, more creative, and more cooperative. President Nakao (left) during a press conference at ADB’s 48th Annual Meeting in Baku, Azerbaijan. The relevance of ADB operations will not hinge on how much we alone can provide but how much we can mobilize. We will need to increasingly play a greater catalytic role – attracting resources from the private sector, spurring greater domestic resource mobilization, drawing greater private savings into productive use, and ensuring a more efficient use of resources. This requires a change in our approach which has so far focused largely on maximizing our own financing. Our assistance needs to be more creative as well. As our clients become more sophisticated and their development challenges more complex, they do not require plain vanilla support from us. Why would any middle income country need our help in constructing a simple highway? They need assistance for innovation, new ideas and new technologies. We will have to reorient our approach to support these evolving needs. We will also need to be more cooperative in our relations with our partners and clients. We need to acknowledge that our support is only a small piece of a very broad development puzzle. We need to work closely with our partners—other financiers, civil society and the private sector and indeed our clients—to be able to add maximum value. We have to consider the use of country systems more seriously. A key challenge will be to improve our responsiveness without diluting our safeguards and fiduciary responsibilities. While we have made progress in improving our response time in recent months, and efforts are in place to further improve our performance, we certainly cannot be complacent. ADB President Takehiko Nakao has called for a stronger, better, and faster ADB. We cannot deliver that without being more catalytic, creative, and cooperative. Eradicating Absolute Poverty by 2030 - are we aiming too low?